Among the natural resources the Spanish prized were sea otters, which were hunted almost to extinction in the area. 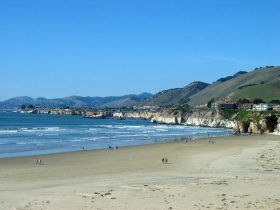 As the otter population reduced, the clam population increased, and while the overall area came to be called San Luis Obispo, the clams washing up on Pismo Beach were so abundant that people could fill buckets. Ultimately, the large, exceptionally sweet clams came to be called Pismo clams, primarily because they were so abundant on Pismo beach, but also because slightly catchier than the scientific name tivela stultorum. I’m not sure in tivela, but isn’t stultorum conjugated Latin for something that’s stupid? 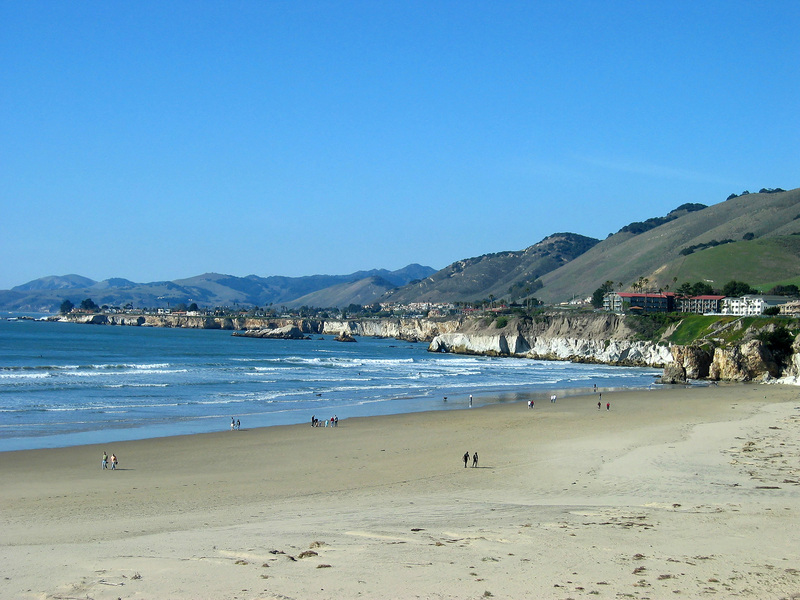 Maybe that’s because Pismo clams hide just six inches under the sand, which isn’t a very clever place to hide from hoards of hungry Americans, who raked them up by the hundreds with clam-forks. In 1947, California banned commercial catch of the Pismo clam; now, with a fishing license, you’re entitled to only ten per day. 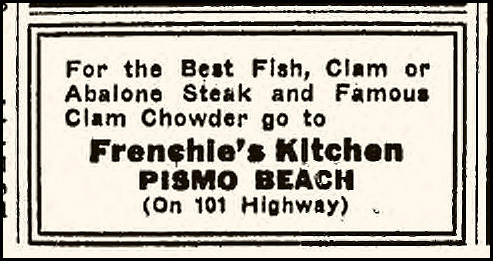 Which means most of the clams in Pismo’s restaurants come from Mexico–or, horrors, aren’t Pismo clams at all, but something else. 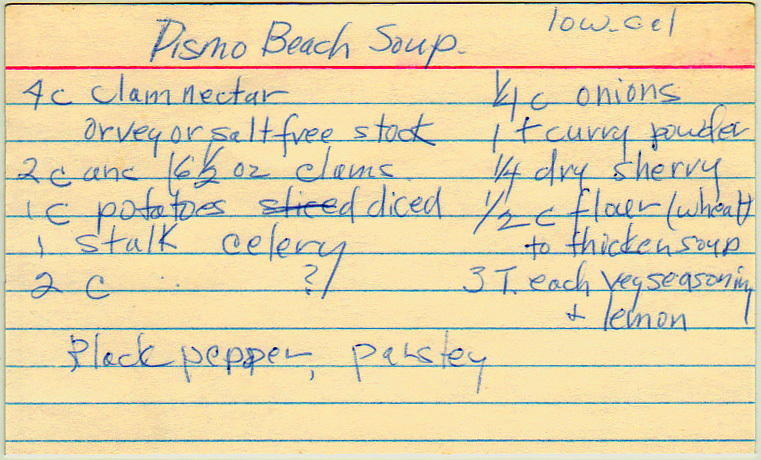 But the area is still famous for its clam chowder, which is probably what this recipe is for. Probably. Because there’s another possibility. There was a Pismo brand of minced clams that also produced clam nectar. Clam juice or liquor is the liquid drained from clams; clam nectar, on the other hand, is a version of the juice where the water content has been reduced and the juice concentrated to the consistency of a stock. 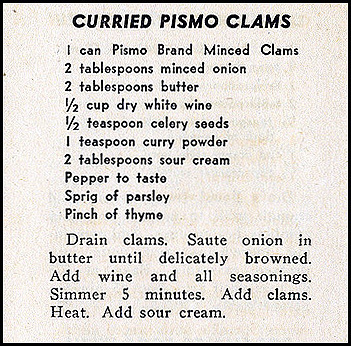 Based on its advertising, Pismo Minced Clams, Inc. was active between the early 1940s and the mid-1970s, although it’s hard to tell if they were producing clams before then. 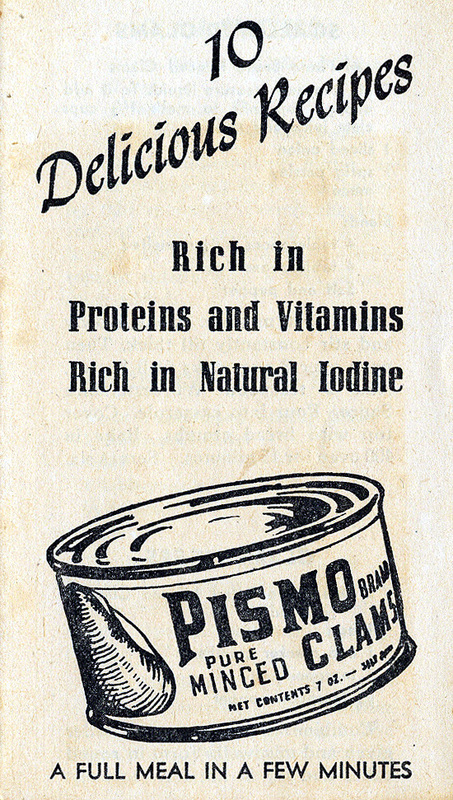 It appears to have been unrelated to the Pismo vegetable canning company from Oceano, California. 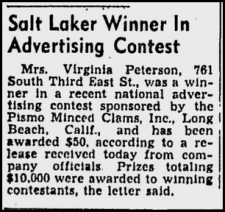 Which is slightly confusing, because Oceano is about three and a half miles Southeast of Pismo Beach, while Pismo Minced Clams was actually headquartered in Long Beach, about 200 miles Southeast of Pismo Beach. 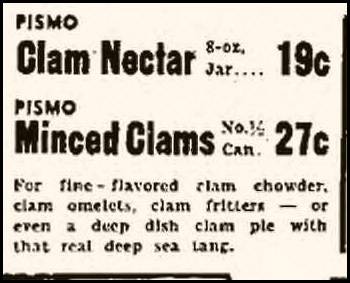 The brand was likely named after the clams, however, so the name situation was probably more of a cultural oddity than a sinister plot. 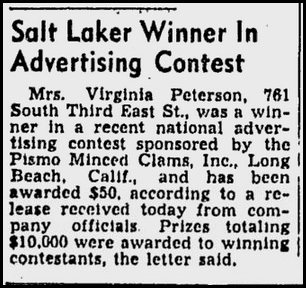 Mrs. Virginia Peterson, 761 South Third East St., was a winner in a recent national advertising contest sponsored by the Pismo Minced Clams, Inc. Long Beach, Calif., and has been awarded $50, according to a release received today from company officials. Prizes totaling $10,000 were awarded to winning contestants, the letter said. Drain clams. Saute onion in butter until delicately browned. Add wine and all seasonings. Simmer 5 minutes. Add clams. Heat. Add sour cream. Well, great. But what’s the question mark in this recipe? If this soup was a chowder, it’s probably either cream or half and half. If it was a bisque, it could’ve been crushed tomatoes, stock, or even just water. Despite the “low-cal” (if I’m reading that correctly) note, I’m still thinking chowder, because because sherried chowder is a classic. And if this is a chowder, then we need to carefully consider the order we want to combine things. Our major concern is avoiding curdling the dairy with the acidity of the sherry and lemon juice; there’s a few ways we can avoid that. One would be to increase the fat content of the cream by adding melted butter, but let’s just take that off the table–we don’t want to eat butter soup. (I mean, we do, but we’re not going to.) Another is to ensure we don’t boil the mixture of acid and fat once it’s been combined. We could add the sherry while cooking and then add the cream at the last minute, or add the cream while we’re cooking and finish it with the sherry. I’ll suggest a method that splits the difference: gently heats the clams and cream together (since we don’t want the clams to cook further than they have in the can) and then add the clam and cream mixture to the stock at the last minute. “Trying to tell a marine mammal to stay on one side of an imaginary line across the water was a dumb idea,” said Steve Shimek, executive director of the Otter Project, which has been fighting against the program for years. Since then, otters have been enjoying the Pismo clams, too, reducing their populations further. Some people complain that the “re-introduction” of otters to Pismo is bad for people. Now, I’m pretty far from an environmentalist, but for the record, I think discontinuing a policy of murdering or kidnapping creatures isn’t exactly “re-introducing” them. December 14, 2009: Sea Otter Mother with pup sharing Pismo clam dinner a few miles up the coast from Pismo Beach, at Morro Bay. Oh, were these your clams? Look how much she cares. By Mike Baird on Flickr. Drain clam juice from the chopped clams and combine with the clam nectar. In a large (think 3-quart) pot, saute chopped celery and onions in a little olive oil until onions are translucent, then stir in curry powder and flour and cook one minute. Add clam nectar and juice, then potatoes and vegetable seasoning. When potatoes are tender, add lemon, sherry, and vegetable seasoning. Bring to a boil, then reduce to simmer. In another pot, add clams, parsley, pepper, and half and half and bring to a simmer. Turn off fires. Pour cream and clams into clam nectar. Serve. Featuring Jell-o Ice Cream Powder. Which was, evidently, a thing. Here’s an advertisement from the July 16, 1906 edition of the Fitchburg (Massachusetts) Sentinel.